High-quality radio communications today, and the associated ability of ships in difficulty to transmit distress messages, make it difficult to envisage just how desperate were the plights of shipwrecked crews in earlier years. An earlier blog (see links at the end of this article) touched on the sufferings of the survivors of the French frigate Medusa in 1817, as were immortalised in the painting by Theodore Gericault. Of these we know, only because the remaining handful were rescued, but in hundreds of similar cases nobody lived to tell of their experiences. One case, not unlike the Medusa’s, was however to occur in 1845 and also off West Africa. This involved the Royal Navy’s role in the so-called Felicidade Affair. 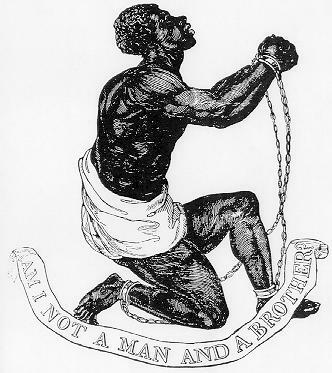 Britain had abolished the Slave trade in 1807 and in the following years many other nations were to follow her example. It was not however until the Napoleonic Wars ended in 1815 that resources could be assigned to active suppression. 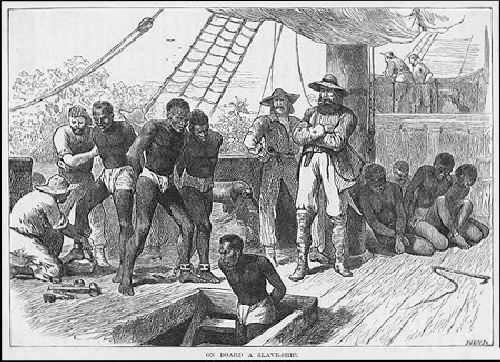 For some five decades thereafter in the Atlantic, and even longer in the Indian Ocean, British warships were devoted to catching ships running slaves from Africa to Brazil, the Caribbean or Arabia. The “Preventative Squadron” of the West Coast of Africa Station was to constitute the main British effort up to about 1860. Though punctuated by periods of intense action, monotonous patrolling occupied most of the time and was made all the more hazardous for being based at locations, like Lagos, where malaria was rampant. The annual mortality rate was 55 per 1,000 men, compared with 10 for fleets in British waters or in the Mediterranean. The ships employed by the Royal Navy were often not fast enough to catch slavers, which were built, often expressly, for speed, and other governments, which gave lip-service to the abolition of the trade (but not abolition of slavery itself), were less than cooperative. 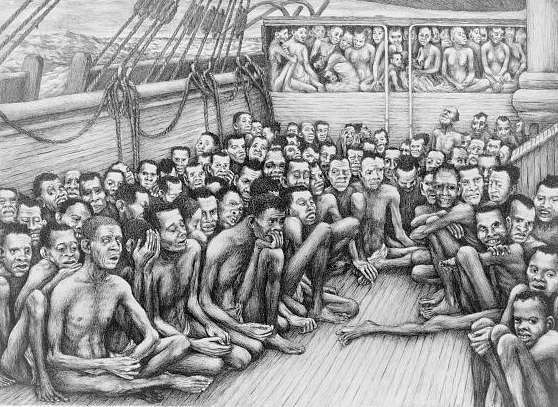 France would not allow boarding parties to search French-registered ships and the American, Spanish, Portuguese, and Brazilian economies were so dependent on slave labour that these governments had no incentive to act effectively. By the 1840s some 25 vessels and 2,000 officers and men were on the West Africa Station and supported by approximately 1,000 “Kroomen”, recruited mainly from Sierra Leone. The Kroomaen came to be highly respected and were later to provide valuable service in similar duties in the Indian Ocean. Monotonous as the patrolling may have been, engagements could be very dramatic and very bloody when slavers were run down. Just how bloody would be proved by the experiences of some of HMS Star’s crew. 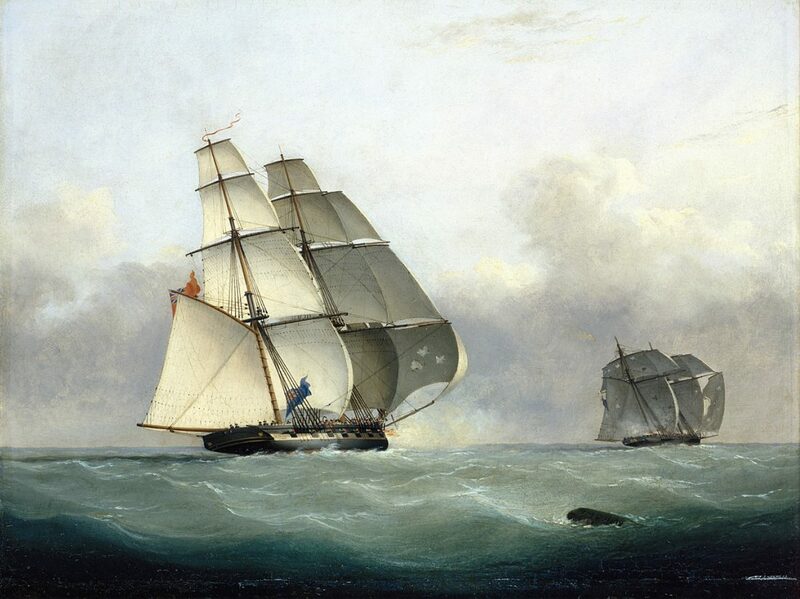 On the 27th February 27th 1845 HMS Wasp, a Cruizer-class brig-sloop launched in 1812, was cruising in the Bight of Benin off the Niger Delta, when a strange sail was seen and pursued. She was boarded in the early evening and found to be a Brazilian schooner, the Felicidade. Though apparently not carrying slaves – not yet – she was fitted for transporting them and she carried a crew of 28. With the exception of her captain and one other they were transferred to the Wasp. Command of the captured Felicidade was assigned to the Wasp’s Lieutenant Stupart, supported by a Midshipman Palmer and a crew of fifteen British seamen. The Felicidade now operated independently of the Wasp and on March 1st captured a second prize, the Echo. This was a major success – no less than 430 slaves on board, and a crew of 28. 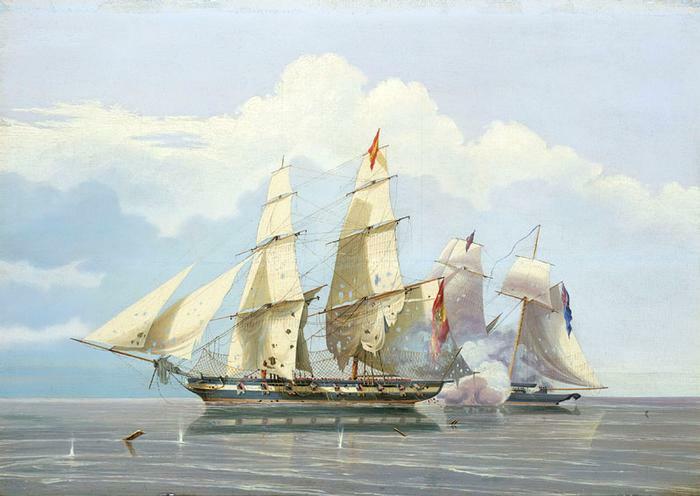 The Felicidade was now, by comparison, a smaller prize and command of her was assigned to Midshipman Palmer, while Lieutenant Stupart took command of the Echo. Palmer was left with seven British seamen and two Kroomen. This in itself was not dangerous – young midshipmen had been taking command of prizes for a century or more – but it was made so by transferring the Echo’s captain and several of the crew to the Felicidade as prisoners. Once on board these desperate men overpowered and murdered Palmer and his small crew, took possession of the Felicidade and sailed her away. the Felicidade’s prize crew were not unlike the thugs shown here. On March 6th the hijacked Felicidade was spotted HMS Star, another ship of the Anti-Slavery patrol. She was boarded and the crew was questioned. They claimed that the vessel was called Virginie and that the wounded men on board had had been injured by a falling spar. There was however sufficient evidence of a fight – blood stains on the deck – and there were indications that British seamen had been on the schooner. The captain and crew, now suspected of murder, were taken on board the Star for questioning in Sierra Leone. The Felicidade was to proceed independently to St. Helena, where a prize court was established. Command of her was assumed by a Lieutenant Wilson from the Star, supported by nine naval seamen. Now sailing independently, the Felicidade encountered a heavy squall. She went over, filled, and sank, so as only to leave part of her bow above water. When the squall passed the whole crew was left clinging to the bow rail. Unsuccessful attempts were made to dive down to extract provisions from the hull and it was clear that she was sinking gradually. Lieutenant Wilson kept his nerve however. He found that there were three knives among the crew and he decided to make a raft of the main-boom and gaff, and such other items floating in the water. Ropes for binding them together were cut from the rigging, a small mast was erected and a topgallant studding-sail was secured to it. On this ramshackle raft ten men hoped to reach the African coast, 200 miles away, without rudder, oar, compass, provisions, or water. Their suffering was great in the twenty days that followed. Almost naked, washed by every wave, unprotected against daytime sun or night-time chill, they had no supplies of either fresh water or food and sharks hovered near by. Five of their number were to die, two Kroomen among them the first to go. Wilson did however manage to maintain control as well as hope. Rain fell occasionally and it was caught in the sail and stored in a keg that had floated out of the schooner. Ingenuity – and desperation – was to turn the circling sharks into the only available source of food. A bowline was made at the end of a rope and used – one can only wonder how many tries were made – to lasso an eight-foot long shark and drag it on to the raft. They killed it, drank its blood, and ate it. Three more sharks were taken in the same way and it was these that kept the Wilson and four others alive until they were picked up in sight of land by HMS Cygnet. The aftermath was a disgrace. The prisoners taken by HMS Star were taken to Britain to be tried for piracy. The assize judge duly convicted them of murder – a capital offence. Fine legal minds now found grounds for appeal. Did a British court-of-law have jurisdiction over a vessel owned by a Brazilian who murdered a prize crew? The appeal succeeded. The murderous thugs were released and transported back to Brazil at the cost of the British taxpayer. One can well imagine the indignation in naval circles and the sense of grievance felt by the families of the murdered men. They had looked for natural justice and were rewarded by flagrant injustice based on legal hair-splitting. “Remember the Felicidade!” was a cry heard often thereafter on the Anti-Slavery Patrol. One suspects – indeed hopes – that it might have led to some more summary justice on later occasions. Parallels with modern sensitives to legal niceties in relation to pirates and others of their ilk are too obvious to need emphasis. It’s 1882 and Captain Nicholas Dawlish RN has just taken command of the Royal Navy’s newest cruiser, HMS Leonidas. Her voyage to the Far East is to be a peaceful venture, a test of this innovative vessel’s engines and boilers. 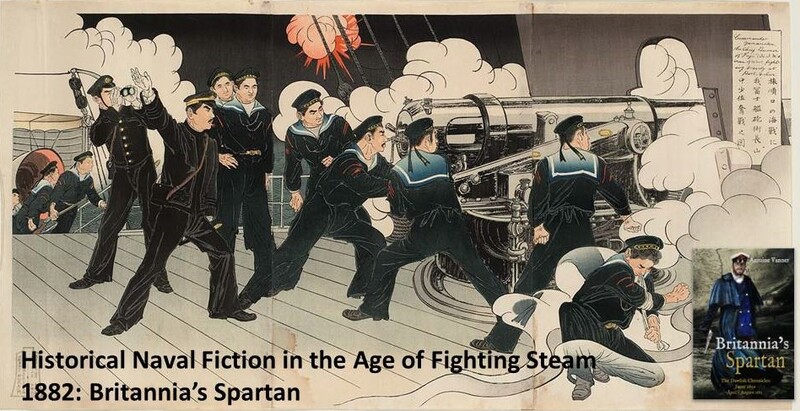 Britannia’s Spartan sees Dawlish drawn into desperate battles on sea and land. Daring and initiative have already brought him rapid advancement and he hungers for more. But is he at last out of his depth?